Each with empty holds and manned only by a handful of sailors and officers whose occasional footsteps echoed hollowly down the long, dimly-lighted passageways, the guinea pig ships steamed the mine-strewn waters to make certain that the explosive-laden machines laid there were no longer a menace to American ships. During the war, American planes, roaring low over these waters, sowed them with a new pressure type mine which wreaked havoc with Japanese shipping. Unlike the common moored, magnetic or acoustic mines, the new weapon is extremely difficult to sweep. The mine is detonated by a change in the pressure of the water surrounding it which ordinarily is caused only by the passage of a large ship over the mine. Anticipating the invasion of Japan, these mines were set to neutralize themselves. That is, they would become non-explosive within a certain time after being laid. But even after sweeping by small ships, first Japanese, then American, the only way to make certain that these mines were no longer dangerous was to run larger ships over them. And that was what the “Guinea Pig Squadron” accomplished, using battered ships that had been damaged by war and storms. These ships were manned by volunteer crews for whose safety all possible precautions were taken. Under the direction of Rear Admiral Arthur D. Struble, USN, Commander Minecraft, Pacific Fleet, the “guinea pigs” swept Nagoya and Bungo Suido waters, and then moved on to sweep the Hiro Wan and Kure areas of Japan’s Inland Sea. The hunting was poor and the luck all good. No mines exploded under them. The ships made their runs with skeleton crews of about 22 men each. The balance of the crews remained in port to take their turn on another sweep or to do necessary below-deck chores that wait until the ships had stopped “pigging” for the day. The ships had been fitted with remote controls so that the engines and boilers could be operated from the main deck and flying bridge rather than below in compartments which would become steam-filled death traps in the event of a mine explosion. To cushion the shock of possible explosion, the crew members stood on mattresses or raised wooden gratings at most of the stations, and wore tank helmets for head protection. The overheads above them likewise were well padded with mattresses. The three ships of the Guinea Pig Squadron “ were the USS Marathon (the flagship), the SS Pratt Victory and the SS Joseph Holt, a liberty ship. The Marathon is a former troop transport. The other two are freighters taken over by the Navy from the War Shipping Administration. The three ships usually steamed in echelon about 150 yards apart. A fleet tug equipped with complete salvage gear followed at the respectable distance of 1,500 yards. In the ships’ checking of the 40-mile channel from Hiro to Kure, the ships made 30 trips - four hours up and four hours back - over a period of six days. Like the rest of minesweeping, the work is monotonous - until something happens. Shattered half-sunk hulls of the Jap Navy and Merchant Marine, many which had conveniently exploded a mine, were passed daily. Each morning the ships were greeted by the punctual Kure mail train puffing along the beach in peacetime safety. Low clouds and icy mist made navigation difficult among the many small islands of the Inland Sea, even though marker buoys (dan buoys) - planted by the fleet of small minesweepers which had preceded the “guinea pigs” into the area - still remained to mark the 2,000-yard-wide channels which the ships were required to check. The skeleton crews of the ships munched on sandwiches during the day. But on returning to home base late in the evening they were greeted with a hot meal prepared by the mess cooks. The Marathon was torpedoed in Buckner Bay, Okinawa, early on the morning of 22 July, 1945 with the loss of 37 of her crew. The gaping hole torn in her port side forwarded by the torpedo was patched and she was put back into service. During her “guinea pig” operations the Marathon exploded a mine while sweeping the Kobe channel but the explosion did only superficial damage to the ship. The Pratt Victory likewise was torpedoed - on the starboard side in No. 2 hold about a month before the war ended. The hole was partially closed by a metal plate that extended down to the water line, but below that the hold was open to the sea. She could not steam at full speed because the sea pouring into the open hold would create a dangerous pressure on the bulkhead that separates it from the next hold. The third ship, the Joseph Holt, went aground in Buckner Bay during a typhoon. Her keel was believed to be slightly bent but it did not interfere with her steaming ability. SALVAGED after being torpedoed, the SS Pratt Victory steams along Japanese coastal waters seeing to explode active pressure- type mines. Lt. Comdr. 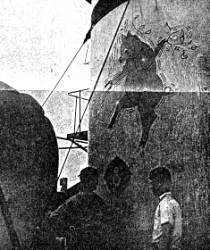 E. G. Rifenburgh, of New York, skipper of the Joseph Holt, stands beneath the eight-ball insignia on the ship’s funnel. The eight ball indicates the vessel is part of Mine Division 8 of the Navy’s mine force. The “coat of arms” is a guinea pig behind an eight ball. WASHINGTON, Dec. 30 (I.N.S.) - The Navy looked with pride today to its “guinea pig squadron,” a group of three ships that have been sweeping Japanese waters for unexploded pressure mines. The three ships of the squadron are the USS Marathon, the SS Pratt Victory and the SS Joseph Holt. The Marathon is a former troop transport, the other two are freighters taken over by the Navy from the War Shipping Administration. SWEPT MANY WATERS The ships, manned by volunteer crews, recently swept Nagoya and Bungo Suido waters and have just finished sweeping the Hiro Wan and Kure areas of Japan’s Inland Sea. So far the ships have been lucky. No mines have exploded under them. The ships make their runs with skeleton crews of about 22 men each. They have been fitted with remote controls so that the engines and boilers can be operated from the main deck and flying bridge without the necessity of anyone remaining below in compartments which could become steam-filled death traps in the event of a mine explosion. BLASTS CUSHIONED To cushion the shock of possible explosion, the crew members stand on mattresses or raised wooden gratings at most of the stations. They wear tank helmets for head protection and the ceilings above them are likewise padded with mattresses. The three ships usually steam in echelon about 150 yards apart. A fleet tug, equipped with complete salvage gear, follows at the respectable distance of 1500 yards. In their recent checking of the 40-mile channel from Hiro to Kure, the ships made 30 trips - four hours up and four hours back - over a period of six days. The Liberty ship Joseph Holt recently returned from Japan where it was used as a “guinea-pig” to detonate pressure mines sowed by B-29’s. Some guys came out of the war bomb happy or shell happy after months of dodging kamikazes or curling up helplessly while enemy shells whizzed overhead or exploded close by, sometimes too close, but the strangest lot of all are the “guinea-pig happy” crews who took their ships into mine-filled waters of Japan after the war. One of these vessels, the Liberty ship Joseph Holt, was in port yesterday with a Navy crew of 79 including six officers and commanded by Lt. Cmdr. E. G. Rifenburgh, USNR, of New York, a former mate on the Grace Line passenger liner Santa Paula. 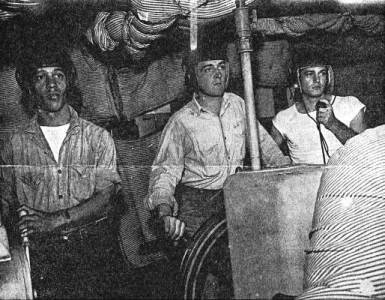 The Joseph Holt together with the Marathon and the Pratt Victory, all manned by volunteer Navy crews, were sent into the heavily-mined waters of Japan after the surrender to set off unexploded mines. But these were a special type of pressure mine. They had been sowed by the B-29’s under Navy mine-layer direction while the war was at its height. The mines were something in the form of depth charges that would rest on the bottom of harbors and in shipping lanes until a ship of 8,000 or 10,000 tons passed over them, rending the disturbing ship to shreds and probably the crew with it. In the last four months of the war the enemy lost 297 ships totaling thousands of tons of shipping in this manner, it was revealed when the American forces got to Tokyo. “Some of these mines were timed to remain fertile until February of this year,” Cmdr. Rifenburgh told this reporter as we sat in his cabin yesterday. “The quick surrender of the Japs left us in a quandary because we would have to use these waters. Someone conceived the bright idea of using ‘guinea pig’ ships to go in and set off those mines. Regular minesweepers were also on the job. “I had been in command of a high octane gas tanker, carrying fuel to Okinawa for the planes based there. I guess they thought that because I commanded a highly vulnerable ship of that character I wouldn’t mind taking over a guinea pig ship. So I ‘volunteered’ and obtained a volunteer crew, some of them high point men eligible for discharge. This was last October when we were at Okinawa. The first ship assigned us was the John Rawlins. We were hardly aboard when a typhoon broke over the island and ships in the surrounding waters were tossed about like feathers, including the Rawlins. She was tossed up on the beach, where she broke her back. “We got off the John Rawlins and took over the Jack Singer, named for the well-known war correspondent who was killed aboard a carrier in the South Pacific. “The typhoon came back with repeated fury and did even more damage than its predecessor. The Singer, like the Rawlins, was helpless and also headed for the beach. On the way our crew hauled in more than 300 survivors from other craft. We stopped counting after we checked off 300. The Singer suffered the same fate as the Rawlins. She broke her back. “Then they gave us the Joseph Holt. It was still blowing pretty hard. The Holt was stripped down so that she was drawing a mere eight feet of water. By this time the crew was anxious to get out of there and start on our guinea pig mission. They preferred the dangers of mines to typhoons, and I might add I thoroughly agreed. The navigator, Lt. P. J. Martin of Lowell, Mass., took up the story from there. He related how the engine room crew was always brought up from below and the engines were operated by remote control in a “padded cell” in the superstructure. The Joseph Holt worked in daylight 10 and 12 hours a day. “We always traveled at full speed,” Lt. Martin said, “through waters we had never been in before. I don’t think any other ship ever missed crashing into so many lighthouses and buoy markers before. Our greatest hazard, however, was the Japanese fishing junks and sampans., They seemed to have sublime faith that we could alter course and not run them down. They didn’t know we were operating by remote control and could not go astern. The idea of the guinea pig was that when we passed over the mine it would be set off and we hoped that because of our speed it would catch us astern if at all. We always used a skeleton crew during these operations, the majority being taken off in LCI’s before each day’s operations. As for those fishing junks, we soon learned that a shot across their bow would scare them out of the way,. The skipper kept a rifle with him on the bridge for this purpose. “In spite of some 300 or more missions we never set off a mine but did manage to shoot at one that was floating. The machine gun we used exploded but the mine didn’t. It sank of its own accord. Cmdr. Rifenburgh said the conclusion was reached that most of them were destroyed by the typhoons that struck before they got there. Most of the work was done in the Inland Sea which was supposedly thick with mines dropped by the B-29’s. Cmdr. Rifenburgh and his men recalled the night of Dec. 23 as one of their worst experiences. The Joseph Holt was in the harbor of Fukuoka on their last job. A 60-mile-an-hour gale and snow blizzard blew up and visibility was practically zero. There was poor anchorage ground at Fukuoka and as the Holt was riding very light the blow caused her to drag her anchors. Nothing happened to the other two ships in the squadron, either, although the Marathon managed to detonate one mine without damage to herself. Both of those ships, by the way, had previously been torpedoed and still had holes in their sides. “It was like putting a gun in your mouth and pulling the trigger on a dud. Since we all came out alive we hadn’t been in danger,” added the skipper as he looked at a picture on the bulkhead of his bride cutting a wedding cake. Cmdr. Rifenburgh went into the Navy in January, 1941. In 1942 he took time out to marry Miss Inez Dorene, a radio network singer who resides in San Francisco. He has been home once since then - a year ago. The ship is on is way to San Francisco.